> Jazz Festivals > A Toast to the 1st Lake Chelan Wine & Jazz Festival! A Toast to the 1st Lake Chelan Wine & Jazz Festival! The first Lake Chelan Wine & Jazz Festival was held May 17-20, 2018 in and around the city of Chelan, Washington. The lake is surrounded by mountains peaking at 7,000 feet topped by 100 or so glaciers which drain into the lake. 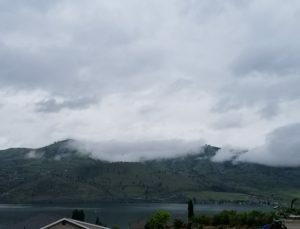 This runoff partially irrigates the many fruit orchards (apples, peaches) dotting the area, and the hillsides are perfect for growing grapes as well, which has led to the establishment of 30 wineries in and around Chelan. 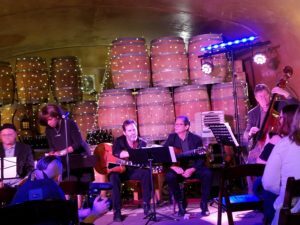 Since wineries are a big part of the area’s economy, and since at least some of the festival’s organizers and sponsors were winery owners, it made sense that many of the concerts were held at local wineries. The festival also coincided with the local wine association’s Spring barrel tasting days, so visitors could sample local wines before they were bottled. Wine-tasting was a bonus to what was more important to me, the music. The musical groups were drawn primarily from Washington state, and the ones I heard were all excellent. Personally, the traditional concert venues–the Ruby Theater and the outdoor Riverwalk Pavilion grounds–made for more enjoyable concert experiences than the overly-loud, cramped bar and indoor winery venues which fostered a lot of talking and moving about during performances. 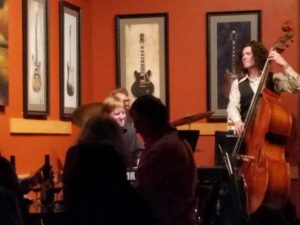 On kick-off day, Thursday, I enjoyed performances at the Rocky Pond Winery tasting room and The Vogue, a bar and coffee shop, both located on the city’s main drag, Woodin Avenue. 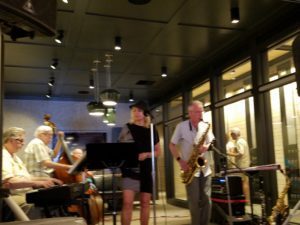 The Rocky Pond hosted The Lake Chelan Jazz Band, a local band with Susan House on vocals/harmonica, John Duff on keyboards, Bob Soost on clarinet and sax, and Steve Sanders on bass. It was a bit crowded but the music was enjoyable and Ms. House’s harmonica playing was a refreshing surprise. We then moved down the street to The Vogue, where Seattle-based Collin Provence (keyboards) and his Trio (Dune Butler on bass and William Mapp on drums) performed in a tiny corner. Again, it was hard to see and hear the band at times but I enjoyed the jazz tunes they played. 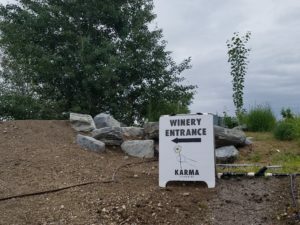 The Friday concerts I attended were held inside the Karma Winery’s cave room, so the drums were incredibly loud even after I donned earplugs. I first heard Pearl Django with guest vocalist Gail Pettis, followed by Lenny Price, an excellent saxophonist, who performed with his combo. The music was great even though the setting was not too comfortable. On Saturday, I enjoyed two performances at the Ruby Theatre, built in 1914. The front row of the curved balcony afforded great views of the musicians. Greta Matassa, a Seattle-based jazz vocalist and teacher, performed with her quintet at the Ruby on Saturday. She has a great voice, supurb scatting ability, and fantastic instrumentalists backing her. Pearl Django and Gail Pettis performed next at the Ruby Theatre, and it was a much more enjoyable concert than I experienced inside Karma Winery. The group’s specialty is gypsy jazz a la Django Reinhardt, but they played many familiar jazz standards. Gail Pettis has a great on-stage personality in addition to her singing artistry. One of my favorites, “Caravan”, with lyrics! 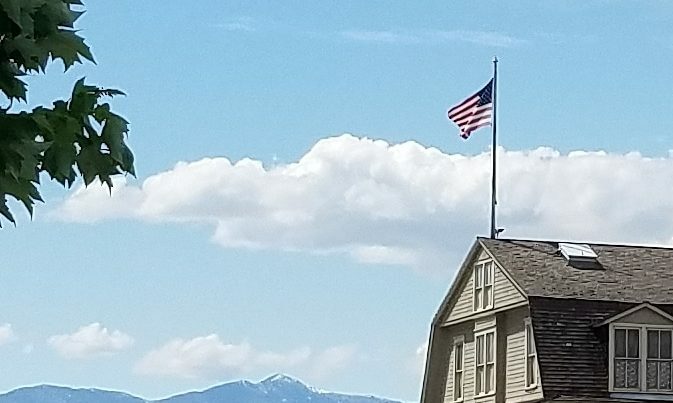 Sunday, the final day of the festival, was brilliantly sunny and the venue, the Riverwalk Pavillion, afforded a great backdrop of the Chelan River which flows between Lake Chelan and the Columbia River. This was a free concert and many families attended, sitting on lawn chairs, blankets, or the grass. I enjoyed the outdoor setting which afforded an opportunity to watch kayaks, boats, and ducks paddle by behind the band. This was a great inaugural festival for this beautiful city. Another nice feature: net proceeds from the festival were to be donated to a local Boys & Girls Club. Bravo to the organizers and musicians! 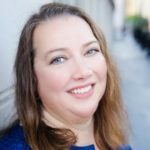 Great event and good summary. Looking forward to year 2.